I have received several questions in recent time about playing video files with the flv file extension on Windows. FLV is the Flash Video extension, and it is commonly used on streaming video sites to deliver contents to web browsers and other streaming applications. You cannot play flv videos in Windows Media Player which is likely being used by users who have submitted the question. Find the appropriate codec to play them in any video player supporting system-wide codecs. Use a media player that ships with its own codecs and support for FLV out of the box. Lets begin with 2), as it is the easier of the two options. My two favorite media players for Windows are VLC Player and SMPlayer which both support FLV video files out of the box. 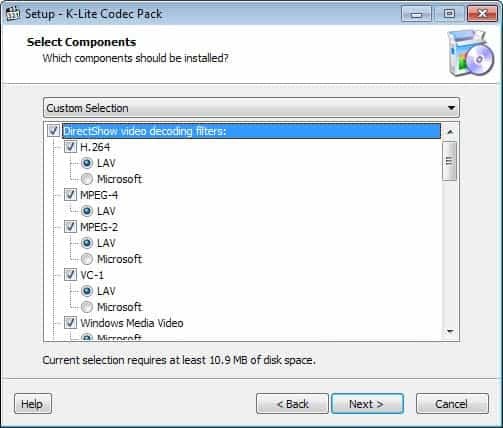 Just download the full version or portable version of either program to your system to add support for the file type on your system.If you do not want to switch completely, associate the flv file type with the downloaded player so that they are loaded automatically in the right application whenever you want to play these video files.The second option is to download and install a codec that you can use to play FLV files in Windows Media Player and other players that don't support the format out of the box.You can either download a program like ffdshow to your system and configure it for that, or, and that is usually the better option, a codec pack that you can install on your system to add support for FLV files among others. The K-Lite Codec Pack is a good candidate for that. It adds support for a variety of audio and video formats that Windows Media Player and some other players do not support out of the box.I suggest you download the basic pack as it is fully sufficient for all your needs. You can also select custom installation to only install some of the codecs that the pack offers. The two core methods of playing FLV files on Windows PCs. My favourite movie player is MPlayer http://en.wikipedia.org/wiki/MPlayer and it too supports many file formats (including the .flv). SMPlayer is a frontend for Mplayer and can be used on both Linux and Windows. The best part is its really easy to use. My favorite media player is Media Player Classic – and it plays flv files too. The Standalone KMPlayer (Korean Mediaplayer) also plays FLV. I have been reading your blog via bloglines for some time now and I’d like to say that you run a hell of a good site, I love the way you point out these amazing little gems to your readers like that SkreemR search engine, totally awesome, finally allowed me listen to some much searched for songs…. so keep doing this and thanks. The sm player is thejust what I needed! Ever since I got my new PC with Vista installed on it I can’t find any flv players that work. I have downloaded and installed 17 so far and most of them just crash. Are there any flv players specifically written for vista or are all vista uses sol? You may try windows xp sp2 compatibility mode, and hopefully the player won’t crash (this worked for smplayer under vista and win7 on my computer). If the player still crashes (usu. on some but not all flv vid. ), maybe its codec is picky or buggy — mplayer has its own codecs instead of using directshow filters. try sothink flv player, which is a barebone front-end for adobe flashplayer activex. or, if you insist on sticking to your more powerful player, convert the flv to other format (using, say, ffmpeg). site via a proxy server. Yes, you can’t play flv files with windows midio player, I used aunsoft flv player, also a free software, I feel it is better than the player you recommend. It support rotate video, playlist, multiscreen, etc..